If you tend to cook from scratch you probably have had several recipes that called for broth, and while canned broth isn’t very expensive, you can make it at home with hardly any effort for pennies! This homemade vegetable broth recipe is very easy. Step 1: Accumulate veggie scraps. I save veggie scraps in a zip bag in the freezer. You don’t need to use new, fresh veggies for broth — old, frostbitten bits work just fine! When I cut up an onion, I put the skin and bits I am not using into the bag. We buy a large bag of uncut carrots with the skins on, I put the tops and bottoms of the carrots into the bag too. Celery tops go straight into the bag, along with that last one or two pieces of celery that get limp before we use them. When I use garlic for sauces I put the left over bits into the bag. Everything that goes into the bag is leftovers – totally free! Once I have two or three gallon-size bags of veggies, I am ready to make broth. Step 2: Cook veggie scraps in slow cooker. 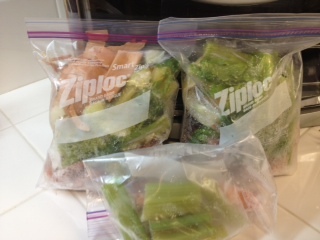 I empty the bags of veggies into my slow cooker, add in a couple bay leaves, and fill with water. I turn the slow cooker on low for five hours and walk away. After five hours, I can just scoop the broth out of the slow cooker and into containers. It lasts in the fridge for a few days, or in the freezer for months! Not only does this easily save me a couple dollars each week, it’s also quite “green” as I’m reusing veggie scraps I normally might throw out. 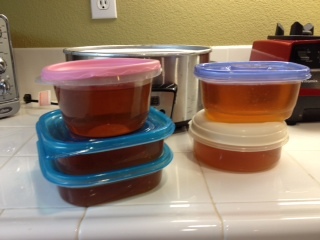 Plus, I put the broth into a reusable container, so I am not throwing out or even recycling a package. 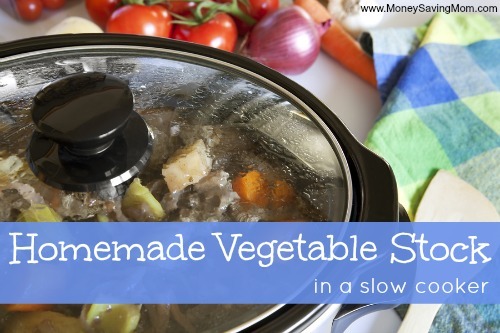 What size crockpot do you use with 2-3 bags of veggies? This is a great idea! I’m totally going to start doing this! I also do this all the time. I use the broth as a base for soup or as a liquid for cooking rice. The cooked vegetable scraps can then be put in the compost pile. I also like to use scraps, including strawberry tops, but NOT garlic or onion to make dog food — you use the leftover cooked stuff from making broth and mix it with leftover meats. I grind the bones from making meat stocks and voila! Love this! I always make my own chicken stock after we eat a whole chicken, now I can use up my veggies! I do this for chicken broth! After cooking a chicken on the bone in my crockpot, I’ll leave all the leftover chicken “stuff” in the crockpot. I’ll add seasoning if there wasn’t much in with the chicken originally, and then add in some carrots, celery, onion, etc. scraps. I often leave it on low overnight, though, and then strain it out in the morning. I love it! So frugal and tastes way better than store bought! I do this too, but with leftover chicken bones. Pop them and veggie scaps into a bag in the freezer for a few weeks, boil them up with salt and pepper, and freeze the stock. Makes great chicken gravy! Same here as well with chicken bones and vegetables. I find running the slow cooker for 18-24 hours creates a really dark, rich broth, although of course it uses a little more electricity. I freeze the broth in ice cube trays, and then when I need a small amount of broth to add to a recipe, I melt a few cubes in the microwave. Thank you so much for this great tip. I cannot tell you how I have lamented over throwing out the wilted celery and celery tops this week. Great pointers. I also have used potato skins, and it really made my vegetable broth even richer. potato peals should add some vitamin C, too! I have a question. I also save scraps, but not onion and potato because of the dirt on them. How do you clean these scraps? Or do you clean them? Wouldn’t there be grit in the stock? Scrub the veggies well before you peel them :). Hi Melinda ~ I wash all the veggies before I cut them for whatever I am making – so the scraps are all clean when they go in the bag – so they are clean, but very frost bitten – haha! For those of you adding in chicken bones, add a big splash of vinegar (I use apple cider vinegar) to the stock before you cook. It draws out the calcium from the bones and doesn’t affect the flavor. I do this with my veggie scraps, only using a stockpot on the stove. You only need to boil them for 30 minutes to an hour. My husband has commented that our soups, lentils, and other recipes which use veggie broth taste so much better now! Plus, it’s free and so much healthier! I like to add rosemary and parsley, of which I have an unlimited free supply in my garden. So smart! I do this every time I make a roast or chicken (http://behealthybehappywellness.com/2012/12/easiest-ever-chicken-stock-for-free/)for beef or chicken stock, but why not just make vegetable stock if I have enough veggies saved up but haven’t done the meat that week! I think I’ll start doing this. Thanks! Are there any veggie scraps that would leave a bad flavor? Like green pepper seeds or slightly rotten or moldy thing? …or any vegges that just might do well, like cucumber ends? Zucchini ends? Sweet potato ends?